Arroyo’s Cafe Famous Tortillas Available! Fresh tortillas, made in the restaurant, are an Arroyo’s Cafe tradition. Did you know that you can bring some of those soft, fresh tortillas home so as to enjoy them with your home cooking? In the old days, Arroyo’s patrons could watch as the fresh tortillas were hand prepared and then shaped by a large machine. Our location may have changed, but our tortillas are still made the same way! 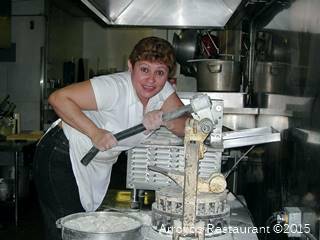 Built back when Arroyo’s Cafe was first opened, our tortilla machine is one of a kind! A combination of love, ingenuity and good luck keeps the tortilla machine running! Did you know you can order and then take home our fresh and famous Arroyo’s Cafe Tortillas! Call us at 209-472-1661 for faster service for tortilla pickups!